Formerly a quarry, this cemetery lies about 9 km (5.6 mi) north of Alghero and it is the best known burial place in Sardinia. 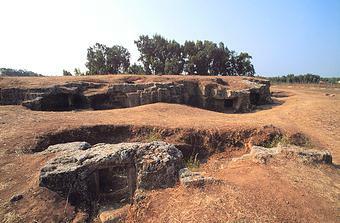 Thirty-six tombs are cut from or made of sandstone, sharing some common design features: a series of steps down from the entrance and a descending passage to a large burial chamber with smaller connecting chambers. Many of the doorways are carved to imitate smoothly dressed trilithons, but what makes Anghelu Ruju famous are the carvings of long-horned bulls' heads in and around three of the tombs (numbered 19, 20 bis and 30). These symbols were sometimes painted in red ochre, and they have been interpreted in different ways. Whether they were linked with the Great Goddess or with the later Sun cult is open to debate. It is worth noting that many of the human bones found in the tombs were lying under a sheet of white shells; this could indicate that most of the ancient Sardinians buried here were fishermen. Among the many grave goods dating from 2200 to 1700 BC found at Anghelu Ruju, there are obsidian, barbed and tanged flint arrowheads, an axe and an awl from Ireland, a copper ring from East Europe, copper-tanged daggers from Spain, Beaker pottery, small marble statuettes, and spiral wire beads.